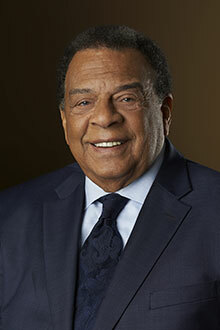 Civil rights icon and humanitarian Andrew Young will deliver the keynote address at Emory University's 174th Commencement, scheduled for Monday, May 13. Civil rights icon and humanitarian Andrew Young will deliver the keynote address at Emory University's 174th Commencement, scheduled for Monday, May 13. Young will also receive the President’s Medal, conferred on distinguished university guests who have enhanced the prospect of peace or enriched cultural achievement. In the decades since Young helped change the course of history as a leader in the civil rights movement, he has built a legacy as a civic activist, elected official, ambassador, social entrepreneur and adviser to presidents. Today, he leads the Andrew J. Young Foundation’s efforts to develop and support new generations of visionary leaders who will create sustainable global approaches to economic development, poverty alleviation and the challenge of hunger. Young was a key strategist and negotiator during campaigns that led to the passage of the Civil Rights Act of 1964 and the Voting Rights Act of 1965. In 1972, he was elected to represent Georgia in the U.S. Congress, becoming the first African-American representative from the Deep South since Reconstruction. In 1977, President Jimmy Carter appointed Young to serve as United States Ambassador to the United Nations, the first African-American to serve in that role. Young was also instrumental in the building of modern Atlanta. He was elected mayor in 1981 and re-elected in 1985 with nearly 85 percent of the vote. Hartsfield International Airport, whose development he championed, made it possible for Atlanta to attract 1,100 new businesses, $70 billion in foreign direct investment and 1 million new jobs to the region during his tenure. It is now the busiest airport in the world. Young also led the successful effort to bring the 1996 Olympic Games to Atlanta. He is the recipient of the Presidential Medal of Freedom and the French Legion d’Honneur and has received honorary degrees from more than 100 colleges and universities, including an honorary doctor of divinity degree from Emory in 1991. Patricia Flatley Brennan serves as director of the National Library of Medicine, the world’s largest biomedical library and the producer of digital information services used by scientists, health professionals and members of the public worldwide. Since assuming the directorship in August 2016, Brennan has positioned the library to be the hub of data science at the National Institutes of Health and a national and international leader in the field. Helene D. Gayle is president and CEO of The Chicago Community Trust, one of the nation’s leading community foundations. An expert on global development, humanitarian and health issues, Gayle spent 20 years with the Centers for Disease Control, working primarily on HIV/AIDS, and was previously president and CEO of CARE USA. She also worked at the Bill & Melinda Gates Foundation, directing programs on HIV/AIDS and other global health issues.